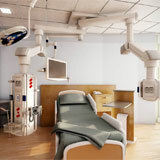 Stryker designs, manufactures and assembles products and technologies including SUPERSUITE Custom Surgical Environments, CHROMOPHARE Surgical Lights, TELETOM Equipment Management Systems, and OPERON Surgical Tables. This course will better inform the designer about Intensive Care Unit room design, critical factors involved in designing an ICU and the key equipment essential to design integration for functionality and space planning. This course also explains they key physical factors of the ICU and equipment that should be taken into consideration when designing a critical care environment.